An easy pie that looks and tastes like it took a whole lot more effort. Preheat oven to 375°F (190°). 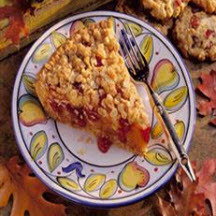 Grease a 9-inch glass pie plate; set aside. In medium bowl, combine oats, flour, brown sugar and baking soda. Add melted butter; mix well. Set aside 3/4 cup oat mixture for topping. Press remaining oat mixture firmly onto bottom and sides of pie plate. Bake 10 to 12 minutes or until light golden brown. Cool slightly on wire rack. Using same bowl, stir together pie filling, cranberries, lemon juice and cinnamon. Spoon filling over hot crust, spreading evenly. Sprinkle reserved oat topping evenly over filling. Bake 18 to 22 minutes or until topping is golden brown.